Mindful eating (dieting, counting calories, and limiting portion sizes) along with regular exercises are the methods that help promote weight loss. But, why not break your routine to try out something different or perhaps add a little extra to the existing one? A good addition would be yoga as it offers a number of other health benefits too, apart from keeping your weight in check. Here are a few yoga postures for weight management. These poses are not only meant to keep a check on your weight but also calm the mind and string the internal system into perfect alignment. Sun salutations are a great way to get your blood pumping at the beginning of a yoga workout. The poses warm up your body and help increase flexibility and strength. Chakra Padasana, also known as the ‘Leg Rotation’ pose is an easy asana that you can master with some practice. This asana helps to burn fat from the thighs, belly, and hips, and around the abdominal region. The asana can be performed on one leg or both legs. However, you will have to make sure to rotate your legs clockwise as well as anticlockwise while performing this asana. Trikonasana is also known as the ‘Triangle’ pose. It not only helps build strength but also helps remove tension and gives your body an adequate amount of stretch. You will need a great sense of balance as well as coordination in order to carry out this asana. 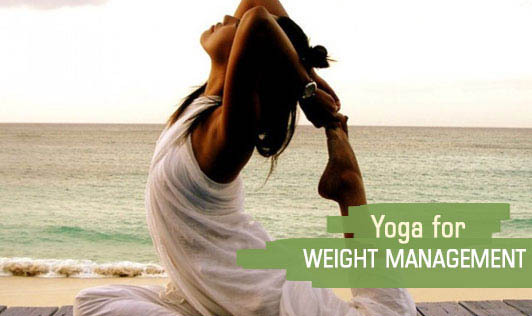 Apart from these poses, Vinyasa and Ashtanga yoga also offer good benefits in weight management. These are vigorous athletic styles of practice and are very popular. Vinyasa helps increase physical activity and burns calories, while Ashtanga might also help reduce overeating caused by stress or anxiety. For those of you, just starting an exercise program, practicing yoga might function as a gentle introduction to physical activity. However, do consult a physician before considering this alternative weight loss and management therapy, and always practice under the guidance of a certified yoga instructor!